41st CMED in Florida was a great success. Thanks to everybody who participated. Learn about it by navigating the rest of the site. Plan to attend the Conference on Management and Professional Development Programs on November 15th, 2019 in Austin, Texas! Interested in presenting? Download and complete the Request for Proposal Form by February 2nd, 2019. Robert K. Prescott, Ph.D., Associate Professor (now Adjunct), Former Director of Executive Education, Corporate Engagement Advisor, Rollins College, Crummer Graduate School of Business. 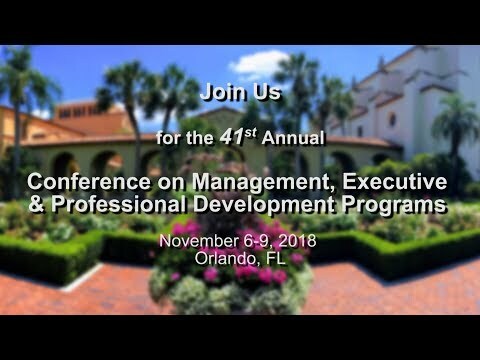 "Looking forward to the learning, the sharing, and to seeing friends from across many CMED conferences. CMED has been a critical part of my professional development. So many memories. So many friends. Even after over four decades in the business of executive education, across four universities, I always know I'll learn a lot, and I'm always willing to share and to try to raise the bar for our industry. Let's make this the best one ever!" Interact with your colleagues in 30 in-depth breakout sessions on new and best practices for sales, marketing, management, operations, leadership, strategy, and technology. Select one of the six Pre-Conference Workshops on Leadership Program Development, Women's Leadership, Resilience, Digital Badge Programs, Trends, and Digital Disruption. Attend 3 plenary sessions to meet thought leaders, grow your network, and develop your plan of action for after the conference. Receive one or both certifications on Conflict Dynamics Profile or Entrepreneurial Mindset Profile offered by the Leadership Development Institute, Eckerd College, a Network Associate of the Center for Creative Leadership. 9th Annual Industry Trends Survey report. Have you spent much time thinking about your personal leadership legacy? What have you accomplished – was it for positive gain? Whom did you help – surely it was for others as well? What did you leave behind – did you leave things better than you found them? Did your efforts make an impact? If you are not thinking in these terms, you are making a mistake as a leader. In this keynote session, the presenters challenge all to think and act in a manner that creates their leadership legacy through efforts that are rooted in the here and now. The clarion point of this session is to provide participants with insights that enhance their legacy thinking and impact delivered by management educators with over 60 years of combined experience working in executive and management education. Can you or your team be more effective at managing change? In times of dramatic change, the ability to understand and intentionally shift how your mind works is a powerful leadership asset. Mindfulness cultivates the capacity to see the hidden barriers to effective action and how they drive your results. Therefore, mindfulness practices can help you sidestep habitual defaults and open novel pathways for action. Through intentional action you can learn to transform your results. First, we will focus on what derails effective performance and how to address it. We will begin by understanding how the nervous system works and can undermine your team’s ability to be effective. We will practice competencies to skillfully manage this process. Second, we will focus on mindfulness as a tool for strategic action and apply it to cases you bring to the course. Expect to walk away with immediately practical tools. Given that young leaders, all leaders really, are often in positions of authority without necessarily having the power to influence others. This session will focus on helping them build bridges with others by first understanding themselves. It is through recognizing the differences present in one’s work group that one is able to learn from them and truly engage employees in order to push the group forward. Social identity management is about understanding one’s own multiple identities and how one’s identity is situated as simultaneously similar and different from the others in the environment. Individuals are constantly crafting images to fit in or stand out from the group. Social identity management allows individuals to be intentional about crafting images that at once are authentic to oneself and also meet the demands of the team and environment. This type of self-awareness takes practice, vulnerability, and social skills. When leaders intentionally present authentic images, they give others insight into who that leader is, and they encourage that same intentional authenticity in those that follow them. Thus, this presentation will focus on the power of self-awareness for crafting authentic identities. Unlock the power of influence. Approach stressful situations with less anxiety and more confidence. Instantly develop trust, rapport and a positive first impression. Participants will be empowered through innovative, timely and practical human behavior principles to learn how to read others and harness gut reactions so they can increase their influence with colleagues and customers and as a result be more efficient building relationships and delivering content. This is an exciting opportunity to rethink the way we communicate and transform the relationship between organizations, their workforce, and their customers. In addition to the following pre-conference and certifications, there is Sales Institute for Executive & Management Development available on November 4-5, 2018. Discuss successful practices in lead generation, nurturing, and conversion for Open Enrollment programs. The session will cover different scenarios and system configurations. It will focus on strategies and tactics of online marketing and database analysis to increase message relevance and maximize lead conversion rate. This workshop will be very interactive with several case studies discussed. It will give participants a comprehensive view of important steps in client acquisition. Facilitators will share their real-life experiences in different settings as well as encourage contributions among participants. They will draw from comprehensive analysis of industry practices, content creation and strategies for its distribution. Participants will walk away with actionable ideas to implement in their own marketing activities. Arne Johnson, Marketing Manager at the College of Continuing Education, University of Minnesota. Arne has 10 years' experience in agency account management in a variety of industries and roles, and over 10 years' experience managing marketing in professional education. He develops and implements integrated marketing plans that promote the growth of U of M College of Continuing Education programs including professional education open enrollment short courses and certificates, contract training, professional conferences, personal enrichment programs and the Continuing Education and Conference Center. Mykola Sarazhynskyy, Vice-President, Marketing Solutions, ProEd. Regarded for his ability to implement complex changes that have a transformative impact on marketing effectiveness and are critical to bottom-line growth, Mykola oversees integrated campaign management including email and direct marketing, paid search marketing, search engine optimization and web analytics, lead generation and nurturing. Prior to his current role Mykola served 6.5 years as a Marketing Director at the University of St. Thomas. He led a team of marketing and customer service professionals delivering brand-consistent online and in-person pre- and post-program experience. He has teaching and speaking experience in graduate and non-degree programs on various topics of Internet Marketing and Online Lead Generation. Customer Experience is said to be the next competitive battleground in most industries, including professional development. While our customers need these skills to succeed in their careers, they also want more from executive and professional education programs. Universities that provide a better end-to-end experience and demonstrate a better understanding of the learner’s needs will benefit from lifelong relationships with their customers. Disney’s MagicBand is an excellent example of a truly transformative customer experience solution. This innovation dramatically reduced wait times, allowed customers to enjoy more rides, and differentiated Disney from other theme parks in Orlando. As a result, loyalty and market share have grown. This workshop, co-developed by the leader of the MagicBand project, will use Disney’s success to highlight essential tools (customer journey maps, strategy canvas, kano model) and skills (out-of-the-box thinking) you need to devise transformations that will delight the student/customer and achieve the strategic goals of your program. Transforming the Student/Customer Experience will conclude with group exercises that focus on executive/professional development processes. Amanda Dietz is the Vice President – Project Management, Business Analysis & Process Management Advisor for Orion Development Group. She has more than 25 years of experience in operations management, auditing & process improvement. Prior to joining Orion, Amanda attained extensive quality and process management experience in the corporate world, principally in the Financial Services sector. She served on the senior management team at InTuition, and Florida Federal Savings bank (now part of Wells Fargo). From facilitators, to content; budgeting, to structure; have some of the most frequently asked questions addressed by CMED Center Leaders with a proven track record of growth and success. According to John Maxwell, “Everything rises and falls on leadership.” If that is true, then ensuring that we are leading our centers well is vital to our organizations, our Universities, and our careers. However, the complexity, bureaucracy and intricacies related to centers can blur the definition and execution of effective center leadership. David Lawrence and Daniel Rundhaug will lead a session on areas of center leadership that are vital to you and discuss best-practices for your consideration and implementation. From the panel approach, attendees will be able to hear different perspectives of what works at various locations and identify helpful models that might translate to their specific context. Discover best practice ways to lead your center strategically and increase your center’s real and perceived value to the University. Become exposed to methods to increase consistency in forecasting custom programs and expanding your center’s influence to businesses around the University. Identify ways to lead facilitators as opposed to being led by them. 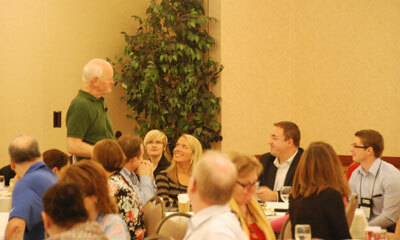 David Lawrence, is Vice President of the Institute for Professional Excellence (IPEx) at Davenport University. IPEx specializes in individual and corporate training, development, and certification programs. He brings over 21 years of experience in assisting businesses improve their organizational learning efforts to increase profitability. IPEx works with organizations in the areas of business, technology, and healthcare to understand their needs and provide solutions designed to facilitate organizational growth. His areas of expertise include: training and developing leaders, improving sales and profitability, and developing and implementing strategic plans. David served as director of sales with a leading high-tech company in the Mid-West. He successfully facilitated sales process improvements in collaboration with companies such as Microsoft, IBM and Hewlett-Packard. Dan Rundhaug Ph.D., is recognized as an exceptional leader in the areas of organizational leadership and development. He possesses skills in communication, research, analysis, strategic planning processes and development. Daniel excels in both leadership and management skillsets, being able to create and communicate visionary direction as well implementing the necessary strategies to see the vision become a reality. Daniel’s quality work will be detailed-oriented and people-centered. Daniel has had a wide breadth of experience in providing value to clients through content creation, facilitation and consultative services. Growing a Center is contingent upon the success of the sales and marketing efforts. While many Centers have capitalized on the use of digital marketing, there is growth in the identification and onboarding of the right sales talent. Many Centers are proceeding with a pro-growth strategy that incorporates the use of sales staff to expand custom sales as evidenced with the continued success of the CMED Sales Institute. The next step in many Centers is the process of posting, hiring and onboarding the right sales person to achieve the revenue goals desired by the University. This can be one of the most challenging tasks in which a Center leader engages. Through the experiences of Davenport University, David Lawrence and Daniel Rundhaug will provide insight into the identified “best practices” of hiring a sales team member. Identify the different types of sales positions and which one is right for your Center at which time. Learn the characteristics of success for Center sales staff to be used in identifying a more likely successful candidate. Understand desired behaviors of sales staff in early and on-going stages of tenure. Learn what to do when it isn’t working? The EMP is a cutting-edge assessment tool based on extensive research into the traits, motivations and skills of entrepreneurs. Available in individual and group formats, the EMP can help leaders, individual contributors and intact teams assess the degree to which they are utilizing an "entrepreneurial mindset." Following this workshop and one follow-up phone call, attendees will be fully certified to use the EMP. Holly Tompson, Ph.D. is an executive coach and senior faculty member at Eckerd College’s Leadership Development Institute. She is also on the Business School faculty at Florida Southern College where she teaches MBA courses in Leadership Competencies and in International Management. Holly has worked as a management consultant for many years and now works one on one with leaders who are pursuing personal or professional transformation. She is a certified executive coach through Georgetown University and is a member of the International Coaching Federation. Holly received her Ph.D. in Organizational Behavior from the University of South Carolina and a bachelor’s degree in Business Administration and Psychology from Trinity University. The CDP focuses specifically on workplace conflict and addresses constructive and destructive behaviors that help resolve or escalate conflict. There are two versions of the CDP: the CDP-360 and the CDP-I. The CDP-360 provides feedback from an individual and his or her bosses, peers and direct reports. The CDP-I provides a self-report version of the instrument. Both versions of the CDP are accompanied by development guides that provide users with advice to strengthen their responses to conflict. Following this workshop and upon completing pre-work in advance of the workshop, attendees will be fully certified to use the CDP. Terry Marschall has been active as a mediator of workplace conflict for more than three decades. In her capacity as a certified mediator and as a master trainer for Mediation Training Institute, she has guided hundreds of people in resolving their differences in the workplace, creating collaborative and productive environments, and preserving the employer's bottom line. Terry's success in resolving conflict flows from a deep understanding of the complexity and dynamics of workplace relationships and their impact on the organization as a whole. Terry's background as a small business owner, consultant, and as a senior executive in the Fortune 500 arena, allows her a good understanding of the issues that face today's workplace. She has held numerous executive level corporate and regional positions with top companies such as the Target Corporation and Woodward & Lothrop/John Wanamaker. She has held positions as Divisional Vice President, Regional Human Resources Manager, Stores Director and Senior Buyer, and has had direct responsibilities for budgets of more than $80M annually and led more than 400-person teams. There are many facets to program development, this is an in-depth look at the steps to program development. This will be an interactive journey from needs assessment to program delivery. We will explore and experience the role of experiential learning in program development, and the balance between content development, delivery and assessment. We will then cover ways to train others to deliver content and maintain quality standards. 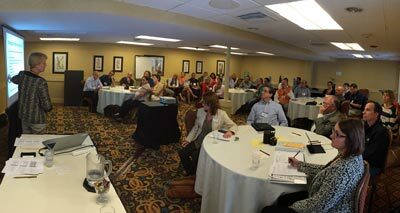 Use the Boise State Leadership Development Program as a framework for program development. Identify ways to customize programs to clients’ needs. Explore methods for train the trainer while maintaining quality standards. Use the ADDIE method to create experiential learning component in your program. Dr. Jeremy Graves brings seventeen years of non-profit leadership and experience into the classroom. He has developed leaders from all walks of life and has cultivated strategic partnerships both nationally and internationally. Jeremy’s passion for strong leadership development coupled with his deep understanding of the role of the team in successful leadership has produced emerging leaders. He holds a doctorate degree in transformational leadership and has developed many sustainable community partnerships throughout his career in the non-profit world. He specifically enjoys guiding companies and their employees to think strategically as they enhance their business portfolios, as well as looking for ways for seasoned leaders to recruit, train, and deploy new leaders into the workforce. Jeremy’s hands-on style of teaching builds community, forges new relationships, furthers productive dialogue, and fosters strategic thinking for leaders from all spheres of the workplace. His research and experience have been in the area of team leadership, and also building and developing teams in the workplace. The Center for Executive Education at Belmont University’s delivery model has always been to combine the expertise from our faculty with outside, industry and content experts. As our custom engagements have grown, so too have the challenges (and rewards!) of working within this hybrid model. During this preconference workshop, CEE’s Executive Director, Melanie Adams, will discuss the challenges inherent in working with outside, contracted facilitators and coaches, as well as the challenges that occur with internal faculty. Participants will explore the lessons learned by Belmont staff as they have worked to make improvements in several facets of their partnership practices by sharing real examples- the good, the bad, and even the ugly- of situations that they have experienced. We will also share our own best practices that have helped us to build new, trusted partnerships with outside experts who are critical to the success of our programs. Additionally, this preconference workshop will allow participants to analyze their own partnerships with delivery staff, whether external/contracted or internal faculty, identifying ways to make improvements to structure and process, communication and transparency, boundary-setting and negotiations, and other means. Melanie also works directly with clients, designing customized leadership development programs for local and national organizations. Her focus is assessing and understanding the needs of both the business and the leaders in those organizations, and then working to design programs that align to both the strategic and human sides of those organizations. In her work for CEE over the last several years, Melanie has also maintained an active teaching role in programs, delivering courses such as Leading Organizational Change, Personal and Organizational Communication, Conflict Management and Difficult Conversations, Coaching and Development for Optimal Performance, Building a Winning Team, Strategic Thinking, The Generations at Work, Emotional Intelligence, Critical Thinking and Decision Making, as well as many others. Away from work, Melanie serves as the Chair on the Board of Directors at the Linden Waldorf School, where her daughter attends school. She also loves to read and cook, and looks forward to her family’s yearly vacation in Maine, where she spent her summers as a child. Melanie resides in West Nashville with her husband and their daughter, and together they spend time outdoors with their Labrador retriever, playing countless hours of fetch. Learn how to use applied neuroscience and predictive analytics to increase your resilience and that of your people. Twenty-Nine percent of the U.S. workforce is burned out. Globally the World Health Organization has stated “Stress is the health epidemic of the 21st Century”. You will learn how the way you spend your first 30 minutes at work may be driving your efficiency down by 60% and your working I.Q. down by 15% . . . and what to do about it. Discuss the latest research that explains why employee engagement remains at 30% despite decades and billions of dollars to raise it. Again, you’ll learn how to predictably raise workforce engagement. This highly interactive session will leave you with the knowledge of how to use applied neuroscience and predictive analytics to increase your resilience and that of your people. Experience the use of three techniques that will increase your resilience so that you can not only succeed in your job but thrive while doing so. Leo Flanagan, PhD, Managing Director/Founder, The Center for Resilience. Dr. Flanagan is a one-of-a-kind advisor who defines “bank balance” as how well off a company’s executives are psychologically. Both a clinical psychologist and a former executive with a top global investment bank, Flanagan helps organizations cope with the alarming — often dangerous — levels of stress and pressure that are impeding performance and throwing professionals’ lives out of balance. Dr. Flanagan started The Center for Resilience in 2008 to train those who choose the most demanding careers to flourish personally and professionally. Over the past 25 years he has worked in boardrooms and C-suites at more than 20 leading financial institutions. He’s guided cultural and business transformations for top banks and health systems and has taught the psychology of business growth to hundreds of global leaders. A licensed psychologist in the State of New York, Dr. Flanagan has held teaching positions at Cornell University, Fordham University, and the University of Notre Dame. He has been a guest lecturer at The Pennsylvania State University, Queens University and University of Richmond. He received his B.A. from Fordham University with a double major in psychology and sociology, his M.A. in Psychology from Hunter College, and his Ph.D. in Psychology from the City University of New York. Learn the framework and processes that an Exec Ed Center used to develop digital badge partnerships with powerhouse clients like The Home Depot, PricewaterhouseCoopers, Dell Computers and WellStar Health System. Markets are changing. Client needs are changing. We need to change too--or we’ll lose business to innovative competitors! The executive education team at Kennesaw State University shares their best practices for designing high-impact digital badge programs. You will learn proven techniques for designing mobile-learning programs that leverage the power of gamification, micro-learning and on-the-job application. This session includes a demonstration of the award-winning Jubi learning-transfer platform that is growing in popularity with learning and development executives across the country. Dan Stotz is the Executive Director of Executive Education and a member of the faculty at the Michael J. Coles College of Business at Kennesaw State University. He has 33 years of higher education experience as both a teacher and an administrator. For the past 25 years he has been working in the executive education field where he has dedicated his professional life to helping individuals achieve their fullest potential as leaders, innovators, and change-makers. Dan has developed an expertise in using gamification techniques to deliver high-quality, research-validated digital badge programs to the business community. Jenifer Renshaw is the Director of Executive Education Programs, Coles College of Business at Kennesaw State University. Jen has extensive experience in operations, program and curriculum design, new product development, marketing and business launch. She has worked in both for-profit and not-for-profit organizations in a variety of industries including 15 years in higher education, health & human services, advertising, and consumer products in the U.S. and abroad. Jen was on the start-up team of Submedia, LLC, an outdoor advertising firm that delivers unique advertising via in-tunnel and walking motion picture displays. Prior to joining Kennesaw State University in 2012, Jen served for 8 years as the Associate Director of the Eugene M. Lang Center for Entrepreneurship at Columbia Business School in New York City. Discuss and analyze trends on how the increasing market demand for more flexible delivery of professional content for adults is driving change in the Higher Ed marketplace. From MOOS’s to noncredit certificates to custom programs, schools need to provide program/product offerings to meet the needs of today’s professionals. Lee will describe how the changing workplace is driving the need for flexible program delivery models as well as a shift in how schools market. This lively presentation will show trend examples of how delivery expectations have changed and how schools can better configure their program set. Lee Maxey, CEO of MindMax, LLC., has been working with institutions of higher education for over 20 years, and has first-hand insight into how evolving educational models and new marketing methodologies have changed the way we interact with our students. Lee will discuss a model for marketing and enrollment services based on the effective management of student engagement throughout the complete enrollment cycle, from the student’s initial decision of whether or not to enroll, to participation in a program and completing the program and becoming a potential ambassador or point of referral for other students. Both the program delivery models and marketing methodology will be discussed as well as business models that can most effectively support this new approach to marketing in higher education. Workshop facilitator Lee Maxey has led MindMax since its founding in 2009, providing technology-enabled marketing solutions to accelerate enrollments for universities. Lee takes pride in building long-lasting relationships with MindMax’s university partners and building a culture focused on results aligned with clients’ specific needs. MindMax has been named to the Inc. 5000 list of Fastest Growing Companies in Education for four years running. Lee has more than 25 years of experience in the education field, and prior to founding MindMax, he helped guide several Fortune 1000 companies in deploying learning technology strategies. He served as CEO at Acadient and chief learning officer at Element K, Pathlore, and Click2Learn. Early in his career, Lee worked in financial aid and admissions at the University of Rochester. He frequently presents at industry events and serves as an editorial board member and columnist for CLO magazine. Lee graduated from the University of Rochester with a Bachelor of Arts degree in Geology. Besides his many hobbies and interests, Lee loves going to the Adirondacks to camp with his wife and three teenage kids. How can you increase revenue streams by meeting client needs that haven’t been met before? How can it be that digital disruption is a GOOD thing for executive education? How can you scale the impact of programs that you offer in this digitally disrupted climate? In this interactive session, which will include digital pre and post work and resources, Sanjay Advani will share success stories of institutions such as INSEAD and other prominent business schools who have met the challenge of digital disruption with a digital response, with remarkable results. He will share how to scale your programs while retaining deep engagement and brand quality, and also discuss the impact of open digital badges. How to start with a phased approach which increases impact and revenue quickly? Ann Roesener, Ann Roesener is Sr. Partner Success Executive at Intrepid by VitalSource. In this role she recruits and then onboards training companies who are moving to a digital format. Her goal and passion is to help content partners grow in revenue, ability and impact. Previous to Intrepid, Ann was at GP Strategies and managed the Microsoft account, one of GP's largest. She managed the strategic stakeholder relationships for the content development, delivery and logistics and strategic program management lines of business. She first became involved when working on the Pitch Perfect Coaching program with Microsoft. This program has won a Gold Brandon Hall Award in the best coaching program. Ann's affinity for training companies came from her work as Director of the Pacific Northwest and Western Canada for BlessingWhite, a global consulting and training firm that focuses on creating high performance work places. Ann has been involved with helping companies get performance increases in their work forces whether it is helping with alignment during a LEAN transition or helping grow internal talent. Ann's expertise in leadership, management, sales, coaching, career development and were honed by 15 years working with MBA programs. Ann has spoken widely on business communications, career, employee engagement, on boarding, succession planning and other topics. * Required. We respect your privacy and do not sell or rent your email to anybody. ProEd Corporation | 8292 Labont Way Suite 202 | Eden Prairie, MN 55344 | 763-656-3527 | Copyright © 2018 ProEd Corporation. All Rights Reserved.